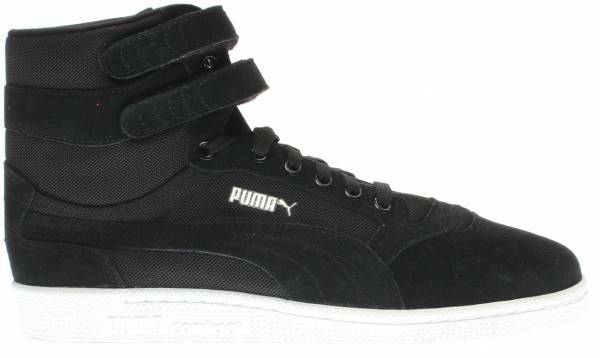 High-top Puma Sky II Hi Core is dressed in stylish, full grain leather upper. As told by skaters, its padded high-collared upper protects the ankle during kickflips without sacrificing flexibility. The foam lining around the ankle safeguards the feet from unwanted twisting, straining, and turning, described by several users. The lace-up closure of the Sky II Hi Core provides an individualized fit and straps the feet in place. Hook and loop strap makes it fashionable especially when mixed with tapered pants and joggers. Casual boots that do not need an extended period to break in this shoe as it naturally comes comfortable, as mentioned by satisfied wearers. A retro style sneaker that is liked by many since it’s ideal for rough days and chill out nights. In spite of its thick high upper frame, this sneaker is lightweight, pointed out by happy buyers. Built with a shock absorbing midsole that reduces tension to the feet when used for several hours in a day. Some wearers said it keeps the feet warm which makes it ideal during the cold months. Sole is rugged, thick, and does not wear quickly. Some buyers who loved its overall feel are purchasing another pair. Not a kind of shoe for summer as it keeps feet toasty. Puma recreated its high-profile basketball classic into a street-ready skateboarding sneaker -- the Sky II Hi Core. It takes in the core components of the vintage hoop shoe by retaining a supportive upper and responsive cushioning yet equipped for skateboarding by having a durable and grippy outsole. Its high-collar construction with dual straps not only grant a lockdown fit but creates a stylish finish to your casual wear. Though priced higher than a typical skate shoe, this multipurpose sneaker boot is made to last for a long time. The Sky II Hi Core takes its cues from Puma’s classic basketball silhouettes. This Germany-based shoe manufacturer known for basketball-inspired classics such as Puma Basket, Puma Clyde, and Puma Suede made its entry into the NBA league during the 80s to the 90s with its star player, the Puma Sky LX. It is a high-profile leather sneaker launched in 1986 with a distinctive leather Velcro strap across the ankle. An 8-time NBA All-Star player and small forward Alex English is one of the athletes seen donning high-top Puma basketball sneakers. He aced a number of games along with the Denver Nuggets squad wearing the Sky LX model. Puma eventually created a sequel to this hoop shoe and unveiled the retro-style Puma Sky Hi in 1992 which is higher than its predecessor and made with double Velcro straps that secure the feet especially during quick court movements. Another sport became increasingly popular, and this is skateboarding. Puma took heed and reworked on its basketball retro sneakers. Soon it came out with a millennial edition of the Sky basketball sneakers and introduced the Sky II Hi Core. This iteration kept the high-collared feature of the classic models, reinforced to become an appropriate skateboarding sneaker. Unlike the earlier versions, the Puma Sky II Hi Core is designed with a durable upper is available in subdued colorways. The high-top Puma Sky II Hi Core resembles the basketball shoe from Puma’s 1990s collection, the Puma Sky LX, which is modified to make it suitable for skateboarding. The entire shoe is toughened using minimal materials to keep its weight down. The upper is covered with stylish full grain leather accented by textile trims which makes it a worthwhile option during chilly weather. The forefoot has air holes that provide room for the feet to breathe. The high upper is thickly padded to reinforce that region and protect the ankle from tension or pressure. This functional and fashionable high-top sneaker complements fitted pants and leggings. Puma’s Sky II Hi Core sneaker boot has a slim profile that tends to run narrow towards the forefoot. Its lace-up closure and dual straps secure the feet and keep it snug inside. For those with wide feet, users suggest purchasing half a size larger than one’s usual shoe size to obtain a desirable fit. This sneaker is available in men’s sizes that range from 4 to 14 US. The high-top Puma Sky II Hi Core is ready for kickflips, backflips, olleing, and so forth as it is made with a superior quality leather upper that is created to be extremely strong. The bottom part of the shoe is built with a robust slab of rubber compound ready to take on the challenges on the streets and pavements. Apart from cushioning that limits the possibility of acquiring foot distress; this sneaker has additional padding that offers stability. Puma’s original basketball shoe, the Sky II Hi is transformed into many styles ideal for off-court uses. Another variation of the high-top Sky II Hi hoop shoe is the Sky II Hi Duck Boots which has a full grain leather upper. Puma Sky II Hi Patent Emboss is the shiny iteration of this former hoop shoe turned lifestyle sneaker. As its name implies, it is made with a varnished kind of leather for that extra polished finish. The Puma branding on the Sky II Hi Core is displayed on the tongue, while the Puma callout lies on the lateral side. Puma has been producing performance shoes and making trails since 1948.